or in print with prior permission from RSIS and due recognition to the author(s) and RSIS. States as the region’s ultimate security guarantor. replace the regional US security umbrella. the region’s nation state cartography. with the Palestinians but share Israel’s perception of Iran as an existential threat. forging Israel’s alliance with Egyptian general-turned-president Abdel Fattah Al Sisi. the kingdom would be willing to sell oil to Israel. first ever op-ed submitted by a member of the Saudi elite to an Israeli newspaper. Qatar to break its ties with the Brotherhood and expel Brothers from the country. brutal crackdown on the group in Egypt and the kingdom’s banning of the Brothers as terrorists. way for this month’s visit to Riyadh by Turkish President Recep Tayyip Erdogan. has “no problem with the Muslim Brotherhood”. surface-to-air missile system that could prove difficult to integrate with its NATO allies. service, military replenishment stops, maintenance bases, and military teaching institutions. than include them on equitable terms. "It is clear that Prime Minister Benjamin Netanyahu will form the next government, so we say clearly that we will go to the International Criminal Court in The Hague and we will speed up, pursue and intensify" all diplomatic efforts, Palestinian peace negotiator Saeb Erekat told Agence France Presse. 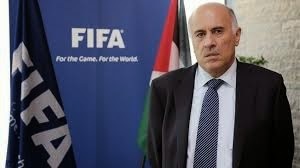 Michel Platini warned the IFA recently that Mr. Rajoub, a former Palestinian security chief with presidential ambitions who also heads the Palestine National Olympic Committee, planned to not only petition FIFA but also UEFA, the European soccer body that Mr. Platini heads. "This time it is serious," Mr. Platini was quoted as telling the IFA’s UEFA representative, Ali Luzon, saying that several European associations would side with the Palestinians, "even if you are right." Israel has been grouped in Europe after Arab soccer associations forced its expulsion from the Asian Football Confederation in the early 1990s. Long-simmering discontent in Ahwaz, the soccer-crazy, predominantly ethnic Arab capital of Iran’s Khuzestan province that Iraqi president Saddam Hussein unsuccessfully tried to exploit when he launched the Iran-Iraq war in 1980, exploded on the pitch earlier this month during an Asian championship League qualifier between the city’s state-owned Foolad FC and Al Hilal of Saudi Arabia. Anti-government protests during the match in which Iranian fans declared support for the Saudi opponent of their home team defied the fact that Saudi Arabia is fighting across the Middle East a proxy war with the Islamic republic that the kingdom frames in terms of sectarian differences between Sunni and Shiite Muslims. Soccer fans defiantly expressed support for Al Hilal during the match and burnt pictures of Ayatollah Ruhollah Khomeini, the late spiritual leader who spearheaded the 1979 Iranian revolution that toppled the Shah Mohammad Reza Pahlavi, and his successor, Ayatollah Ali Khamenei. 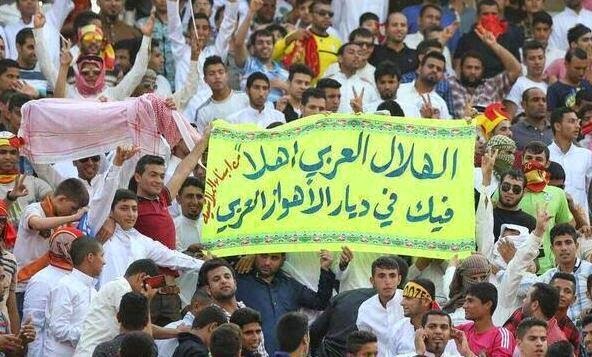 Fans also sported banners emphasizing the Arab character of Ahvaz. Scores were arrested as fans fought police near the stadium for three hours after the match. The opposition National Council of Resistance of Iran said that fans further carried banners declaring that “We are all Younes,” a reference to a street vendor who immolated himself a few days before the match in the nearby city of Khorramshahr. The Human Rights Activists News Agency (HRANA) established by Iranian activists said the vendor set himself on fire after municipal officials seized his grocery kiosk. The agency said Mr. Younes was operating his kiosk although he had yet to have his application for a license approved. Support for the Saudi team by fans in Ahvaz whose ethnic Arab population is Shiite in majority took on greater symbolic value against the backdrop of Saudi efforts to forge an alliance of Sunni nations and groups to counter the feared expansion of Iranian influence in the region if and when it reaches agreement with the five permanent members of the UN Security Council and Germany on the future of its nuclear program and the lifting of sanctions against the Islamic republic. The negotiators hope to achieve agreement before a deadline at the end of this month. Habib Jaber Al-Ahvazi, a spokesman for the Arab Struggle Movement for the Liberation of Ahwaz (ASMLA), a group that demands independence for Ahvaz and is believed to be responsible for a series of bomb attacks in the city in 2005, 2006 and 2013, told online Arab nationalist Ahvaz.tv that the soccer protest was part of an “ongoing confrontation between demonstrators and the forces of the Persian occupation.” Mr. Al-Ahvazi said the immolation of Mr. Younes had sparked the protest. ASMLA operatives have maintained contacts with rebels fighting the Iranian-backed regime of Syrian President Bashar al-Assad. A no-longer existent unit of the defunct Western-backed Free Syrian Army named itself the Al-Ahwaz Brigade while the ASMLA used references to the anti-Assad rebels to identify their attacks in Khuzestan. ASMLA has also expressed support for insurgents in Iran’s Baluchi and Kurdish provinces whom the government in Tehran sees as part of US covert operations aimed at destabilizing the Islamic republic. The Iranian Arab refusal to side with Saddam failed to earn Arabs in Ahwaz the credit they deserved despite the fact that criticism of government policies is often framed in ethnic and nationalist terms. Government suspicions have been fuelled by recent conversions to Sunni Islam of a number of Iranian Arabs, a move that largely constitutes individual efforts to escape perceived discrimination. Iran’s crackdown earlier this month on the protesting soccer fans was as much in line with its intolerance toward expressions of anti-government sentiment as it was a response to references to Ahwaz in Saudi media as Arab territory. The Iranians believe that it is an urgent priority to eradicate the Arab race in al-Ahwaz; a necessity for the state to be stabilized. This means that the authorities do not hesitate to tighten their grip on the district’s residents, prompting them to flee the country through various means of intimidation such as summary executions, detaining citizens, confiscating their salaries, depriving them of employment, and preventing them from speaking their mother tongue… It is imperative that the Arabs take up the al-Ahwaz cause, at least from the humanitarian perspective,” Ms. Al-Hazzani wrote. Qatar is proving to be its own worst enemy in achieving its soft power goals of embedding itself in the international community as a good citizen despite having put crucial blocks in place. Its failure to convincingly follow through on promises to reform its controversial migrant labour system, demonstrate its sincerity in stopping a flow of funds to jihadist organizations, and develop a robust communications strategy that counters legitimate criticism as well as attacks by its detractors has cost it significant reputational damage and diplomatic and political capital. As a result, Qatar has found itself in recent years under continuous attack amid allegations of corruption in its successful bid to host the 2022 World Cup, denunciation by human rights and trade union activists of its migrant labour sponsorship system as a form of modern slavery, and charges that it tolerates funding of militant Islamist groups ranging from Hamas, the group that controls the Gaza Strip, to the Islamic State, the jihadists that have conquered swaths of Syria and Iraq. Qatar suffered its setbacks despite its development of a foreign policy that emphasizes mediation and peace-making; a sports policy that seeks to garner empathy from a global public by hosting high-profile sports mega events and acquiring top league foreign soccer clubs; a strategy to acquire high profile commercial and cultural assets; a world class airline that positions Qatar as a hub connecting continents; and a global news and sports broadcaster that competes with the BBC and CNN. These policies led to Qatar’s hosting of the Al-Udeid airbase, the largest US military facility in the Middle East as well as the U.S. Combat Operations Air Center for the Middle East, making it a key regional US ally. Yet, its alliance like sponsorship of BelN, a global sports broadcasting network that gives Qatar exposure to an audience in which many know little, if anything, about the Gulf state has earned little reputational capital. Similarly, Qatar’s Arabic language Al Jazeera channel has lost much of the admiration it initially won the Gulf state by revolutionizing a Middle Eastern and North African media landscape that had been dominated by state-owned broadcasters and projected Qatar as a country that encouraged free and open debate – a key element of soft power. Al Jazeera Arabic’s success made it the most widely watched regional news channel until its image as a free-wheeling news channel was undermined by perceptions that it had become a partisan tool in backing controversial groups like the Muslim Brotherhood in the aftermath of the Arab popular revolts. Qatar further earned few brownie points by accommodating an Israeli diplomatic presence in Doha until the 2009 Israeli attack on Gaza or being the only Arab country to have ever openly invested in Israel with funding for a soccer stadium in the Galilee city of Sakhnin and of two Israeli Palestinian clubs. Qatar’s successful mediation of the release of hostages held by Islamist groups and conflicts in various part of the Middle East and North Africa positioned it as the skilled and experienced go-to negotiator. Yet, the allegations of funding of terrorism, its differences with Saudi Arabia and the United Arab Emirates over the Brotherhood and corruption in its World Cup bid have offset whatever mileage Qatar earned from its mediation efforts. Finally, Qatar’s engagement with critics such as human rights groups and trade unions served to project it as a forward looking state willing to embrace change in sharp contrast to other Gulf states that regularly bar entry to foreign activists and either deprive domestic critics of their nationality or imprison them. But its failure to follow through on promises has undermined activists’ confidence, sparked criticism and threatens to refuel demands that it be deprived of its right to host the World Cup. A member of the executive committee of world soccer body FIFA warned that Qatar could lose its hosting rights if it failed to implement recommendations that included the creation of a minimum wage for each category of construction worker made by a Qatar-sponsored review of its labour legislation by British-based law firm DLA Piper. That acknowledgement strengthens demands by human rights and trade union activists that Qatar embrace the principle of collective bargaining that would eliminate its system of setting wages for migrant workers according to nationality. “It is not entirely certain how the comparative wage differences have been derived, or why. The QF (Qatar Foundation) Standards state clearly a universal principle in the world of work, namely,,, workers shall receive equal pay for equal work irrespective of their nationality, gender, ethnic origin, race, religion or legal status,” said a report by migration scholar Ray Jureidini, compiled for the Qatar Foundation. QF is one of two Qatari institutions in the forefront of attempting to address activists’ concerns. The report recommended introduction of a minimum wage to eliminate discriminatory wage policies as part of an effort to ensure Qatar’s competitiveness. “If Qatar wishes to have wage rates of migrant workers set by supply and demand in a local labour market, then it will need to lift the current kafala sponsorship system, allow workers to change employers without sponsor approval (as is now the case in Bahrain) allow collective bargaining to take place that will establish wage rates, terms and conditions of all occupations filled by non-Qataris in the country”, the report’s said. A similar recommendation was made by the United Nations Special Rapporteur for migrants’ human rights. The kafala system puts workers at the mercy of their employers. At the core of Qatar’s inability to turn the building blocks of its soft power strategy into successes from which it could reap the fruits is a lack of political will to respond to criticism it recognizes not only with words and window dressing but convincing deeds. Qatar’s ability to capitalize on its soft power assets is further hampered by a lack of management infrastructure to ensure monitoring and enforcement of existing legislation, rules and regulations; and a need to manage domestic public opinion, particularly within the factitious ruling Al Thani family. In addition, Qatar has been unable or unwilling to develop a communications strategy capable of addressing criticism stemming from its winning of the right to host the World Cup and a backlash from its shift in foreign policy from strict neutrality and mediation to proactive intervention in support of popular revolts that swept the Middle East and North Africa in the second decade of the 21st century. Qatar’s desired status as a good citizen of the international community has been called into question by statements by senior US Treasury officials as well as think tank reports alleging that it maintains links with jihadist groups and at the least turns a blind eye to the funding of such organizations. Prominent among the reports is a three-part study entitled ‘Qatar and Terror Finance’ by the Foundation for the Defense of Democracies. “Qatar’s performance in the fight against terror finance tests the notion that it is a reliable friend and ally,” the foundation report concluded. Qatar’s credibility is further called into question by its support for Hamas, the Islamist group that governs the Gaza Strip, its differences with Saudi Arabia and other Gulf states over its alliance with the Muslim Brotherhood, and a United Arab Emirates-funded anti-Qatar media campaign that has succeeded in generating negative media reporting. In many ways the debate about funding of jihadist groups by wealthy individuals in the Gulf and particularly Qatar is slanted. For one, most estimates of the income of the Islamic State conclude that donations account for a small fraction of its total revenues. "These rich Arabs are like what 'angel investors' are to tech start-ups, except they are interested in starting up groups who want to stir up hatred. Groups like (Jabhat) al-Nusra and ISIS (the former acronym for the Islamic State) are better investments for them. The individuals act as high rollers early, providing seed money. Once the groups are on their feet, they are perfectly capable of raising funds through other means, like kidnapping, oil smuggling, selling women into slavery, etc," said former U.S. Navy Admiral and NATO Supreme Commander James Stavridis, now the dean of the Fletcher School of Diplomacy at Tufts University. Other sources of Islamic State’s include taxation of people, businesses and transport routes. Although Qatar is but one of several Gulf states that hosts alleged jihadist financiers, it has taken the brunt of public criticism because of its high profile mediation-driven foreign policy that seeks to maintain relations with all parties, including some that are internationally proscribed; organized media campaigns to undermine its credibility by the UAE as well as Israel; and an inherent reluctance by Western governments to confront head on Saudi Arabia, the largest and wealthiest of the Gulf states, whose puritan interpretation of Islam, constitutes an ideological source for jihadist thinking and creates a breeding ground for militant Islamist views. The argument against Qatar is strengthened by alleged links between suspected financiers and sports. In addition, Qatar’s emphasis on sports offers its critics an additional line of attack. Prominent among the alleged financiers is Abdulrahman Omar al Nuaimi, a historian of religion and former head of the Qatar Football Association (QFA), who was detained for three years in 1988 for his opposition to government-led reforms particularly regarding women’s rights. Al Nuaimi was released in 1991 on condition that he no longer would speak out publicly. Although Al Nuaimi was originally arrested on the orders of the then emir, Sheikh Hamad bin Khalifa Al-Thani, he was received by Hamad after the emir had ordered his release. Al Nuaimi was identified in late 2013 as a specially designated global terrorist by the US Treasury and blacklisted in 2014 by the European Union and the United Nations. The Treasury charged that Al Nuaimi had “provided money and material support and conveyed communications to al-Qa'ida and its affiliates in Syria, Iraq, Somalia and Yemen for more than a decade. He was considered among the most prominent Qatar-based supporters of Iraqi Sunni extremists.” The Treasury charged Al Nuaimi had transferred at least $2.6 million to Al Qaeda, had served as an interlocutor between Qatari donors and Al Qaeda in Iraq and assisted the group in its media communications. It also said Al Nuaimi had channelled funds to Al Shabab jihadists in Somalia and Al Qaeda in the Arabian Peninsula (AQAP) in Yemen. Al Nuaimi despite his designation has denied the allegations and is believed to remain a free man in Qatar fuelling allegations that he has close ties to senior officials in the Qatari government and ruling family. Al Nuaimi issued his initial denial at a news conference hosted by the Doha-based Arab Center for Research and Policy Studies (ACRPS). ACRPS is headed by Azmi Bishara, a former Palestinian member of the Israeli parliament who left in Israel in 2006 after being accused of having spied for the Lebanese Shiite Muslim militia Hezbollah. Bishara has since become a Qatari national and a close associate of Qatari emir Sheikh Tamim bin Hamad Al Thani, who also serves as chairman of Qatar’s National Olympic Committee (NOC) and is a member of the International Olympic Committee (IOC). Tamim as NOC head gave Al Nuaimi an award for his contribution to Qatari sports in 2010. The politicization of the debate about Qatar was highlighted by the fact that the UAE in November 2014 designated 83 organizations as terrorists that included the bulk of usual jihadist suspects as well the Muslim Brotherhood and groups in the West believed to be affiliated with it. The list glaringly failed to list Hamas whose leader in exile Khaled Mishal is based in Doha. Proscribing Hamas, which has strong links to the Brotherhood, would have put the UAE in direct confrontation with a significant segment of Palestinian public opinion and risked stirring significant segments of Middle Eastern and North African public opinion. To be fair, the international community is divided on its judgement of both the Muslim Brotherhood and Hamas. Arab states, even those like Egypt and Saudi Arabia that have turned against Hamas, have like the UAE stopped short of proscribing Hamas and insist on the Palestinians’ right to resist continued occupation of the Gaza Strip and parts of the West Bank. Egypt on the one hand has shut down underground tunnels linking the Sinai with Gaza in a bid to cut off supplies to anti-government insurgents in the Egyptian desert peninsula as well as Hamas but has so far maintained its lines open to Hamas in recognition of the fact that no interim or more permanent agreement with Israel is possible without its consent. A senior Hamas official, Mousa Abu Marzouk, moreover remains resident in Cairo. Similarly, Saudi Arabia has taken Hamas to task for its ‘mistakes’ that include in the words of former Saudi intelligence chief Prince Turki bin Faisal al Saud its “ill-advised alignment with Qatar and Turkey” but has been careful not to group it among Islamist groups targeted by the kingdom. This lay of the land could change with an Egyptian court hearing a petition to categorize Hamas’ military wing as a terrorist organization. A possible outlawing could lead to similar measures in Saudi Arabia and the UAE. It would weaken Egypt’s ability to mediate between Israel and the Palestinians and strengthen Qatar’s credentials as one of the few backchannels to the group. Nonetheless, Qatar walks a fine line in seeking to carve out a niche of its own and how it projects that effort to the world and maintaining its relations with Saudi Arabia and other Gulf states. The Gulf states agree on the need to ring fence their neck of the woods against multiple threats, including widespread domestic discontent, jihadism and Iran. They differ however on how to accomplish that with Qatar believing that it can best achieve its goal by supporting popular and Islamist movements elsewhere in the Middle East and North Africa. Qatar can afford to do so because despite domestic criticism of government policies, its rulers are among the least threatened in the region and Qatar’s success in assuring harmonious relations between its majority Sunni and minority Shiite Muslim communities. By contrast, Saudi Arabia, Oman, Bahrain and Kuwait have experienced various degrees of expression of popular discontent over the past four years while the UAE like others has cracked down on any form of dissent. Banning the Brotherhood in Saudi Arabia and the UAE meant cracking down on a group that was at the least a strong influence on major underground opposition forces in the two countries. It also enabled Gulf states to attempt to distract public opinion from domestic grievances and concern about the economic fallout of dropping oil prices – issues that are of less concern to Qatari rulers. Meanwhile, the Brotherhood and/or its affiliates remains legal in the United States and Europe and was only proscribed by Egypt, Saudi Arabia and the UAE in 2013. The banning of the group as a terrorist group was primarily driven by the Egyptian military’s protection of its vested interests with the coup in 2013 that toppled Mohammed Morsi, a Muslim Brother and Egypt’s first and only democratically elected president. Saudi opposition to the group is rooted in its threat perception of any Islamist group that offers an alternative to the kingdom’s version of Islamist rule, particularly if it involves free and fair elections. The UAE’s rulers have long seen the Brotherhood and Qatar, one of the group’s main supporters, as a threat because of the Brother’s appeal among a significant segment of the Emirati citizenry. In 2009. Sheikh Mohamed went as far as telling US officials that Qatar is "part of the Muslim Brotherhood." He suggested that a review of Al Jazeera employees would show that 90 percent were affiliated with the Brotherhood. Sheikh Mohammed charged that Qatar was facilitating Iranian inroads into the Arab world and that “he sees Iranian influence in the Brotherhood very clearly as both a way to agitate the Arab populace and render the traditional leaders of Arab society impotent.” Other UAE officials privately described Qatar as “public enemy number 3”, after Iran and the Brotherhood. Because of the Brotherhood’s inroads into the UAE, Sheikh Mohammed said he had sent his son with the Red Cross rather than the Red Crescent on a humanitarian mission to Ethiopia to cure him of his interest in Islamist teachings. “His son returned from the mission with his vision of the west intact and in fact corrected. He was astonished that the Christians with the Red Cross were giving food and support to anyone who needed the support, not just to Christians. His son had only heard the stories of the west through the lens of Al Jazeera and others similarly aligned,” the embassy recounted Sheikh Mohammed as saying. None of this diminishes the fact that Qatar has systematically failed to act against proscribed financiers of jihadist groups that reside and operate from the Gulf state. Nevertheless, in shaping public opinion, particularly in the United States, the UAE and Israel critics have remained largely silent about Kuwait’s role but have been happy to pinpoint Qatar. Ron Posner, Israel’s ambassador to the United Nations, headline an opinion piece in The New York Times: Club Med for Terrorists. “It is time for the world to wake up and smell the gas fumes. Qatar has spared no cost to dress up its country as a liberal, progressive society, yet at its core, the micro monarchy is aggressively financing radical Islamist movements,” Posner wrote. In the only major manifestation of soccer fan discontent since protests in 2013 against world soccer body FIFA in Brazil in the walk-up to the World Cup, football supporters in London rallied in September outside the Qatar embassy to demand that the Gulf state be deprived of its right to host the 2022 competition because of its support for Hamas. The protest under slogans that included ‘Football fans deserve better than Qatar,’ ‘Kick Terrorism out of Football,’ and ‘Qatar: Stop Funding Terrorism,’ was organized by the Sussex Friends of Israel and the Israel Forum Task Force. “We should not negotiate with terrorists, we should not finance terrorists and we should certainly not reward terror by awarding the World Cup to Qatar in honour of its role in financing terror… (It is) time for the referee of world opinion to blow the whistle and show a red card to Qatar. It’s time to kick Blatter out of FIFA and time to kick terrorism out of football and it’s time to kick the World Cup out of Qatar,” lawyer Mark Lewis, one of the protest’s organizers told the demonstrators referring to FIFA president Sepp Blatter. Organizers said the protest was the beginning of a campaign to deprive Qatar of the World Cup. Similarly, the UAE, the world’s largest spender on lobbying in the United States in 2013, sought, according to US media reports to plant anti-Qatar stories in American media. To do so it employed California-based Camstoll Group LLC that is operated by former high-ranking US Treasury officials who had been responsible for relations with Gulf state and Israel as well as countering funding of terrorism. Camstoll signed a consulting agreement with Abu Dhabi’s state-owned Outlook Energy Investments LLC on December 2, 2012, a week after it was incorporated in Santa Monica, California. Camstoll reported receiving $4.3 million in 2012 and $3.2 million from Outlook in 2013 as a retainer and compensation for expenses. Camstoll’s “public disclosure forms showed a pattern of conversations with journalists who subsequently wrote articles critical of Qatar’s role in terrorist fund-raising,” The New York Times reported. Camstoll’s reported multiple conversations with reporters of The New York Times, The Washington Post, The Daily Beast, Dow Jones News Wires, Financial Times, Bloomberg News, CNN and the Washington Free Beacon. The Washington Post story quoted among others “a former U.S. official who specialized in tracking Gulf-based jihadist movements and who spoke on the condition of anonymity because much of his work for the government was classified.” The description of the source fits the bios of Camstoll executives, including the company’s owner, Matthew Epstein, a former Treasury Department official who served as its financial attaché to Saudi Arabia and the UAE; Howard Mendelsohn, former Acting Assistant Secretary of Treasury, who according to a US State Department cable “met with senior officials from the UAE’s State Security Department (SSD) and Dubai’s General Department of State Security (GDSS)” to coordinate disruption of Taliban financing, and other former Treasury officials who had been contact with Israel regarding their strategy to counter funding of Palestinian groups. Qatar’s response to the media campaign against it is illustrative of its inability to fight its public relations and public diplomacy battles, clumsiness in developing communication strategies, meek denials of various accusations and failure to convincingly defend its at time controversial policies. In response to the labour criticism, two key Qatari Institutions, the Qatar Foundation and the 2022 Supreme Committee for Delivery & Legacy, issued lofty charters governing the working and living conditions of migrant labours to be enshrined in contracts of companies contracting with them. Qatar has yet to enshrine in national legislation all of the principles established by the charters and sufficiently beef up its monitoring and supervision infrastructure, including a satisfactory number of labour inspectors, to ensure implantation of current rules and regulations. Such moves would convince its critics of its sincerity despite the evident hope that improvement of working and living conditions will fend off demands by human rights and trade union activists that it abolish its sponsorship system. As a result, Qatar is losing the confidence of human rights groups like Amnesty International and Human Rights Watch that were willing to give it the benefit of the doubt. In a bid to counter its World Cup critics, Qatar contracted Portland Communications founded by Tony Allen, a former adviser to Tony Blair when he was prime minister, according to Britain’s Channel 4 News. The television channel linked Portland to the creation of a soccer blog that attacked Qatar’s detractors by Alistair Campbell, Blair’s chief communications advisor at Downing Street Number Ten and a former member of Portland’s strategic council. Channel 4 reported that the blog projected itself as “truly independent” and claimed to represent “a random bunch of football fans, determined to spark debate” of “astro-turfing,” the creation of fake sites that project themselves as grassroots but in effect are operated by corporate interests. Portland admitted that it had helped create the blog but asserted that it was not part of its contractual engagement with Qatar. The blog stopped publishing after the television report. On the terrorism finance front, Qatari officials have rejected allegations that they turn a blind eye to the flow of funds to jihadist groups but defend the importance of maintaining lines to all parties as part of their mediation-focused foreign policies that allows Qatar to step in at times that others are unable to propose solutions or build bridges. “I am very much against excluding anyone at this stage, or bracketing them as terrorists, or bracketing them as al‑Qaeda. What we are doing is only creating a sleeping monster, and this is wrong. We should bring them all together, we should treat them all equally, and we should work on them to change their ideology, i.e. put more effort altogether to change their thinking,” Qatari Foreign Minister s Khalid bin Mohamed al-Attiyah told an international security conference in Manama in December 2012. Al-Attiyah was referring to Syria but his remarks go to the heart of Qatari policy. Left unsaid in the statements of Qatari officials is the fact that maintaining relations with various groups serves to shield the Gulf state from being targeted. It also, like in the case of the Muslim Brotherhood enables Qatar, sandwiched between two regional giants and rivals, Saudi Arabia and Iran, with Islamic systems of government that Qatar goes to great effort to evade. The statements moreover have done little to prevent perceptions of Qatar from changing from that of a neutral mediator to one of a country that actively intervened by backing rebels in Libya and Syria as well as supporting the government of Muslim Brother Mohammed Morsi in Egypt. Instead, Qatar’s more activist foreign policy made it more vulnerable it to overt and covert attacks on its credibility by its detractors, prominent among which Saudi Arabia, the United Arab Emirates, Egypt and Israel. A recent study of Qatari mediation efforts by The Brookings Institution concluded that “while Qatar’s record of success in these efforts is mixed, an in-depth analysis of its mediation history reveals a number of areas that, if fine-tuned, could potentially enable Qatar to play a much-needed role in regional conflict resolution... Both in terms of distance and cultural affinity, where opposing parties can meet to hash out their differences in a relatively neutral setting.” The study recommended that Qatar establish an independent non-governmental entity to lay the groundwork for dialogue and mediation and use its financial muscle to invest in long-term development of areas prone to and affected by conflict, rather than to incentivize parties to come to the negotiating table. This would have to involve proper and systematic documentation of its mediation efforts as a resource for the training of diplomats and negotiators. The recommendations reflected a more fundamental problem that Qatar confronts across the board in its soft power strategy whether it relates to the hosting of sports mega events like the 2022 World Cup or its mediation-focused foreign policy: a failure to anticipate potential roadblocks; a lack of institutional capacity and manpower to prepare and follow-up on issues and initiatives that result from its successful establishment of the building blocks of the strategy; differences within the ruling family and between various state institutions; centralization of decision making that restricts the ability of officials at lower levels to respond publicly in a timely and adequate fashion to public relations challenges; a need to balance its mediation with Saudi concerns about meddling in areas like Yemen which the kingdom views as proprietary; and an inability to develop a communications strategy that would allow it to manage public perceptions. To be fair, Qatari complacency about widespread criticism was in part motivated by the international community’s failure since the Gulf state became independent in 1971 to tackle it on issues like the conditions of migrant labour, human rights and political freedoms. Similarly, Qatar was until 2013 and in fact is until today not the only Gulf state to engage with groups like the Muslim Brotherhood. Saudi Arabia as far back as the 1950s offered refuge to thousands of Brothers who fled repression in Egypt and Syria. Over time, they integrated into Saudi society, occupied key public sector positions, including in the education sector, and blended their politicized Islam with Wahhabism, the puritanical Saudi interpretation of Islam developed by the 18th century warrior priest, Muhammad ibn Abd al-Wahhab. Bahrain, despite joining Saudi Arabia and the UAE in withdrawing its ambassador from Doha in 2014 for a period of eight months and inviting Saudi troops in 2011 to help in brutally repressing a popular revolt, remains hesitant to act against the Brotherhood. Bahraini rulers fear that a crackdown on the Brothers could undermine its support in their minority Sunni Muslim power base. Qatar’s lack of preparedness for criticism and its failure to develop a communications strategy was evident in initial Qatari responses to the migrant labour criticism and its handling of high-profile labour disputes. Qatari officials believed when the migrant labour issue first exploded that it was a public relations battle they would not be able to win and therefore should best ignore in the conviction that it would eventually blow over. They rejected the notion that failure to engage amounted to surrender of the battlefield, losing an opportunity to conquer a moral high ground, and allowing a wound to fester. Hassan al Thawadi, secretary of the Qatar 2022 Supreme Committee that was later restyled as the Qatar Supreme Committee for Legacy and Delivery admitted as much at a Leaders in Football conference in 2011. “When Qatar was pulled from the envelope in Zurich on December 2nd (2010), amid all the celebrations and joy, we knew that the work was only just beginning. What we did not know or expect was the avalanche of accusations and allegations that we would face in the immediate aftermath of what was a historic day for sport in our country and for the wider region. I‘m sure all of you in this audience are well aware of the very tough challenges we have faced since our success last December. Baseless accusations were made against our bid. We were presumed guilty before innocent without a shred of evidence being provided,” Thawadi said. Yet even when an upcoming communications fiasco is evident, which Qatari officials recognize needs to be addressed swiftly and decisively, they find themselves hampered by vested interests of various institutions and a centralized decision making process. Employment-related complaints by two international players, one of whom was barred from leaving Qatar for 18 months and as a result saw his career wrecked and has since been forced to work as a waiter in France, have undermined Qatari arguments in favour of its kafala system. Belounis was locked into a salary dispute with Al Jaish SC, the club owned by the Qatari military that refused to let him leave the country until the labour dispute against the advice of others that Qatar would suffer greater reputational damage than the dispute was worth. He said the dispute was about almost two years of unpaid salary. This is a crazy story… I cannot move around freely, I cannot work anymore, I'm 33 years old ... Who wants a player who has not played for months? Frankly, my career takes a hit,” Belounis told Jeune Afrique. On balance, Qatar’s mediation track record over the past decade proved its ability to bring parties to the table for negotiations that produced the defusing of an immediate crisis rather than a long-term solution. Qatar initially played a key role in talks in Cairo to end Israel’s assault on Gaza in the summer of 2014 before it was side lined by Egypt with the backing of Saudi Arabia and the UAE who not only wanted to isolate Qatar but position post-coup Egypt as a key player in regional geopolitics. Months before, Qatar arranged a prisoner exchange in which five Taliban detainees were released from the US detention facility in Guantanamo Bay into Qatari custody in return for the release of US Army Sgt. Bowe Bergdahl. US Secretary of State John Kerry said the deal “exemplifies how vital our partnership with Qatar is and will remain.” The release of the Taliban came a year after an effort failed to allow the Taliban to open an office in Doha as a basis for negotiations with the United States in advance of the withdrawal of NATO forces from Afghanistan. In March 2014, Qatar successfully negotiated the exchange of 13 Syrian and Lebanese nuns held by Jabhat al Nusra for 150 women and children held by the government of Bashar al-Assad. Reports that Qatar had paid Jabhat al Nusra ransom money as part of the deal has fuelled questions about the Gulf state’s relations to jihadist groups. A seven-country, in-depth investigation into efforts to persuade the Islamic State to release hostages established Qatar as the major alternative to private security firms operating on behalf of insurance companies that have extended kidnap and ransom policies mostly for Westerners employed by non-governmental organizations. “The alternative’s name is Qatar. The filthy rich dwarf state in the Persian Gulf likes to ingratiate itself as the international community’s best friend and when needed conducts negotiations and even foots the bill. The emir’s pockets are deep, the investments pay off in diplomatic weight,” the investigation concluded. Qatar’s successful negotiation of the release of hostages is in contrast to the durability of agreements to end regional disputes. Qatar’s success in negotiating an initial ceasefire between the government and Houthi rebels in 2007 and a peace agreement in 2008 ultimately failed to pave the way for a lasting solution to the conflict that addressed underlying grievances amid acrimony between the Qatari and Yemeni governments despite a Qatari pledge of up to $500 million in aid for development of Houthi areas. The failure ultimately led to a virtual Houthi takeover of the country in 2014. Qatar successfully negotiated an agreement in 2008 to end the worst crisis in Lebanon since the end of the country’s civil war in 1990 that averted a new round of fighting but failed to address issues that would have built the confidence among the country’s multiple sectarian communities needed to shield it against threats emanating from the Shiite group Hezbollah’s continued existence as the foremost armed non-state actor and the fall-out of regional conflicts like Syria. Similarly, Qatar persuaded various parties in Darfur to agree on a ceasefire in 2011 that remained shaky because of the refusal of powerful rebel groups to accept it and its failure to tackle the grievances that had sparked the conflict. Qatar’s mediation-focused foreign policy nonetheless challenged traditional academic wisdom on the limits on the ability of small states to project power and the assumption of an automatic link between size and power. “Weak states are not entirely weak. They have important internal sources of strength which they have learned to use to their advantage. They have also learnt to manipulate the strength of the great powers on their own behalf, and to draw on this external source of strength to further their own national interest … In evaluating the relative strength or weakness of a state, its geographic location must be taken into account,” wrote sociologist Michael Handel. In doing so, small states benefit from the ability to continue a successful policy of neutrality or alliance membership but replace a failed policy by a new choice. Such a simple alternative is not available to great powers, which are not only concerned with direct threats to their own security, but with broader national interests,” added political scientists Iver B. Neumann and Sieglinde Gstöhl. Qatar falls into both categories of mediators developed by political scientist Jacob Bercovitch: “trust-based mediators who basically clarify misunderstandings; and resource-based mediators “who at times rely on some positive or negative incentives to get things moving.” Qatar frequently has acted as a go-between attempting to clarify positions and narrow differences while using its financial as an incentive. Potential tacit concessions Qatar may have to make to non-Muslim soccer fans during the World Cup, including expanded areas where consumption of alcohol would be allowed, public rowdiness and dress codes largely unseen in the Gulf state, and the presence of gays. Concern about domestic criticism prompted Qatar’s emir, Tamim, to signal his intention to focus of domestic rather than foreign policy when he succeeded his father, Sheikh Hamad bin Khalifa Al Thani, the architect of the Gulf state’s soft power strategy, in June 2013. The policy shift was waylaid by the coup in Egypt almost immediately after Tamim’s ascension; the eight-month rupture in diplomatic relations with Saudi Arabia, the UAE and Bahrain less than a year after he took power; and the Islamic State’s expansion from Syria into Iraq and declaration of a caliphate. Qatar has invested heavily in a soft power strategy whose pillars include sports and foreign policy as well as the forging of strategic alliances that were designed to enhance its global reputation as a prominent, forward-looking and modern good citizen of the international community. That investment has yet to pay off. Rather than being widely viewed as a reputable host of sport mega events and as a force for good in Middle Eastern and North African geopolitics, Qatar is under attack for allegedly being a slave state that treats migrant workers working on infrastructure, including facilities for the 2022 World Cup, as serfs. It successful bid to host the tournament is mired in controversy. Similarly, Qatar stands accused as allowing funding to flow to jihadist organization and as a promoter of militant Islamist organizations. While there is certainly substance to the allegations, Qatar has valid counter arguments and has taken steps to address criticism. Those steps however have done little to halt escalating reputational damage let alone turn around a tidal wave of negative publicity. To do so, Qatar would not only have to match its promises and words with deeds but also develop a communications strategy to counter both legitimate criticism and its multiple distractors who are willing to go to significant length to undermine its credibility. Qatar has shown little inclination to do either. Jacob Bercovitch. 2011. Introduction: Or How to Study and Do Research On Mediation, in Jacob Bercovitch (ed), Selected Essays: Theory and Practice of International Mediation, London: Routledge, p 1-10.